By Matthew Gold, Louis Jacobson, Joseph Kennedy, Anderson Small on Thursday, November 29th, 2018 at 2:48 p.m.
With a possible shutdown looming on Dec. 7, Democratic and Republican lawmakers are battling over what should go into a bill to keep the government lights on. The key obstacle to a bipartisan agreement is how much should be spent on President Donald Trump’s border wall. Trump is pushing hard for $5 billion in wall funding. But Democrats, newly emboldened by their gains in the midterm elections, may not be willing to give that much. Which brings us to a question: How much has already been spent on the wall? In an Oval Office interview with the Daily Caller, a conservative publication, on Sept. 5, Trump said, "We’ve already started the wall. We’ve gotten $3.2 billion for the wall. We’ve done a lot of work on the wall." He reiterated that amount in a rally in Billings, Mont., and at a fundraising event in South Dakota a few days later. As lawmakers go head-to-head on funding, we decided to look into how much has been spent on the wall so far in his presidency. Short answer: What he said is too high, and misleading. How much money has been allocated? As we’ve reported, Trump reluctantly signed a $1.3 trillion omnibus spending bill on March 23, 2018, that he threatened to veto in part because his promised border wall was "not fully funded." The bill included $1.6 billion for some projects at the border. Here's the catch that Trump omits: None of that can be used toward the border wall promised during the presidential campaign. Lawmakers approved a continuing resolution in late September to keep spending flowing until Dec. 7. They didn’t address the controversial topic of border wall funding, in order to forestall a government shutdown shortly before the midterm elections. Trump gets to his $3.2 billion total by factoring in an additional $1.6 billion, which appears to stem from funding included in a pending Senate bill. But that bill hasn’t been passed by the Senate yet, much less approved by the House and signed by the president, so it’s premature to count that as solid funding. So, right off the bat, the $3.2 billion figure Trump cited is twice as high as has actually been approved for the wall. It’s also not going toward Trump’s vision. Is it being spent on a Trump-style border wall? Here’s how the government is authorized to spend the $1.6 billion package that Congress approved last spring. Trump shared photos back in a March tweet that touted "the start of our southern border WALL." According to Los Angeles Times reporting, the photos were for the replacement of an estimated 2.25-mile border wall in Calexico, Calif., built in the 1990s using recycled scraps of metal and old landing mat. That barrier is being replaced with a 30-foot high bollard-style wall. Plans for that replacement began in 2009, the newspaper reported. The newspaper quoted Jonathan Pacheco, a spokesman for the Border Patrol’s El Centro Sector, as having said earlier in March: "First and foremost, this isn’t Trump’s wall. This isn’t the infrastructure that Trump is trying to bring in. 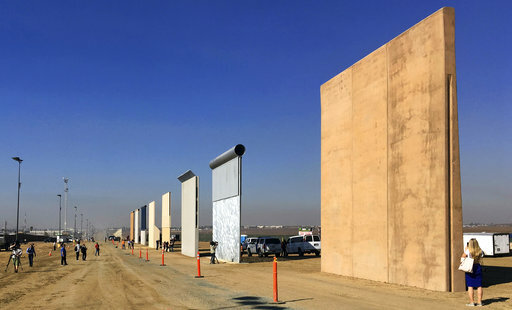 … This new wall replacement has absolutely nothing to do with the prototypes that were shown over in the San Diego area." Customs and Border Protection issued a news release on March 30 that said the $1.6 billion funding would provide for the construction of about 100 miles of new border wall. However, it uses the term "border wall" to refer to fencing and other structures, not the prototypes Trump has touted. For instance, the news release highlights a 20-mile replacement of primary vehicle barrier in Santa Teresa, N.M.; replacement in San Diego of 14 miles of outdated steel plate barrier with a bollard structure; replacement of at least two miles of border barrier in Calexico with 30-foot bollard wall; and four miles of bollard wall in El Paso. Trump's claim "conflates walls and fences," said Hannah R. Gurman, a clinical associate professor at New York University who has researched the history of U.S. immigration enforcement and its intersection with criminal prosecution. As the Dec. 7 expiration of the continuing resolution looms, lawmakers are negotiating about how much new border security funding to approve. Trump told Politico on Nov. 28, "I will tell you, politically speaking, that issue is a total winner." But Democrats, who were never convinced in the wall’s utility, are considered unlikely to give Trump everything he wants. The outcome of the border-funding battle should be clarified in the next week or two, but one thing is clear: Trump’s previous assertion that "we’ve gotten $3.2 billion for the wall" already is wrong on several counts. "We’ve gotten $3.2 billion for the wall."